Our late-summer selection for GNBC, hosted by GeekyNerdy Girl, is Carrie Fisher’s memoir Shockaholic. Right from the dedication (to her daughter and the former president) you can tell this book will be entertaining. This short memoir actually reads more like a series of essays than a chronological life story. I ended up really liking the format because it was easy to pick up and put down. Each chapter is a different topic, ranging from her family and friends to her mental and physical health. There is very little mention of Star Wars at all. Of course, I was expecting some discussion of her struggles with mental health, because I know she was a great advocate on that topic, but it is really only covered directly in one chapter. However, I do think it was such a big part of her life that it bleeds over into everything she talks about, especially her family. Carrie Fisher clearly had a unique sense of humor. I actually put this book aside for a few days when I started, because it can be pretty dark humor at times and I just wasn’t in the mood for it. But as I kept reading, I really appreciated it and laughed out loud a lot. I thought the funniest story was when she went to dinner as a young woman with some senators in DC. She refused to be intimidated by them, and I was totally cheering for her as she held her own with inappropriate humor. I also really loved that there are personal pictures throughout the book. And the captions are hilarious, rarely pertaining to the picture at all. Instead, they sound like a historical documentary. For example, her friend Michael Jackson reading her memoir is labeled as Harry Truman playing golf. I didn’t know much about her family prior to reading this book, so learning about her famous parents, Debbie Reynolds and Eddie Fisher, as well as Eddie’s wife Elizabeth Taylor, really helped me understand her better. She had such a unique perspective on fame, having grown up around such famous people; this seems to be one reason she was able to understand her friend Michael Jackson so well. In fact, she was an extremely self-aware person, and this comes through in all her writings. It was a battle she continued to fight until, and even as, she died, and I think, as does her daughter Billie, that she would want to continue to be open about that battle no matter the results. She was used to living her life for others, and she continues to do so even in death as an icon, not just in sci-fi, but also for those of us who also fight mental health battles. I’m still working on finishing our last book, The Handmaid’s Tale, but in the meantime, please join us at GNBC next month reading one of Carrie Fisher’s memoirs, Shockaholic. This installment of the GNBC features As You Wish: Inconceivable Tales from the Making of The Princess Bride. It is a memoir by Cary Elwes (who played Westley in the film) about his time spent making that film. If you have never seen The Princess Bride…well, first of all, you should go see it, because it’s wonderful and funny and appeals to so many types of people. But obviously this book is intended for fans of the movie, and as I consider myself one, I enjoyed it greatly. I have been a fan of Cary Elwes in many roles, including his turn as a thief on Psych, and his role as a Robin Hood with an English accent. He has always seemed like a very charming man, and consequently his book is very charming. He comes across as very modest and gracious, (mostly) level-headed but with a spirit of joy in life. I’ve never read a memoir from a film set before, so it was very interesting to me to learn not just about The Princess Bride, but how all movies are made in general. Shooting on location, training, stunts, cast interactions, the whole process. For example, the very first scene Elwes shot was the Fire Swamp, which involved setting Robin Wright (Buttercup)’s dress on fire, and then later practically improvising the stunt where Westley dives headfirst into the quicksand (he was originally just supposed to jump in feet-first). He also trained with fencing professional for months to be able to do the swordfight scene with Inigo. I was constantly telling my husband (also a fan) all these little tidbits I was learning as I went along. The book also makes frequent use of perspectives from the other cast members (Fred Savage, Christopher Guest, Christopher Sarandon, Billy Crystal, Mandy Patinkin, Wallace Shawn, etc. ), the director Rob Reiner, and the writer William Goldman (who also wrote the original book). Everything that everyone says just gives you a sense that they all had such a good time making this film, that they put so much love into it, and it has a very special place in their hearts. I think it really shows in the finished product. Because of this happy energy, it is a fun, light read, and because of the format of vignettes and anecdotes, it is very easy to pick up and put down if you don’t have much time for reading. The book covers many of the famous scenes from the movie, as well as some behind-the-scenes things, and it even covers a little of the release of the movie. I always kind of figured The Princess Bride was considered a “cult classic,” because I had never heard of it until I was in high school, and the book outlines why this is. Upon its release, the studio had trouble marketing it, apparently because of the mix of genres, and though the initial audience reaction was great, the movie basically flopped. But once it started making its way onto VHS and getting spread by word of mouth, its popularity picked up,eventually becoming such that the cast had a 25th anniversary reunion screening at the Lincoln Center in 2012. The movie is now thirty years old and just as popular as ever. I think this book will definitely change the way I see the movie the next time I watch it. I will now never be able to NOT think about the fact that Westley is actually getting knocked out by Count Rugen (no acting required!) and that he had a broken toe in some scenes, etc. It does kinda pull the veil of movie magic back a bit, but I still find it entertaining, just in a different way. Reading the memoir also inspired me to start reading the original novel, which I am also really enjoying. Even just getting through the author’s forward is an entertaining journey. Next time on GNBC we will switch back to fiction, so keep an eye out for a new pick soon. The cover is beautiful, and even has some raised details. 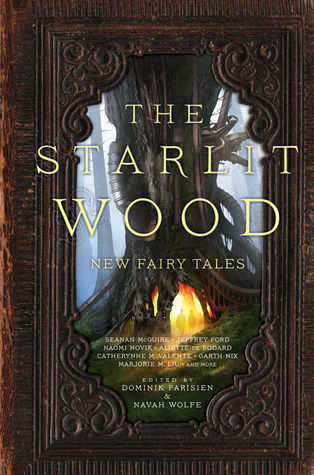 Welcome back to the bi-monthly GNBC; this time our selection was The Starlit Wood, a collection of short fairy tale retellings. Check out GeekyNerdyGirl’s original post here. I finished all the stories, but it was a near thing. It’s been a while since I’ve read short stories, so I really enjoyed getting back to that. But the content of these stories was so diverse in terms of tone, style, setting, and fantasy and sci-fi elements that it was very hard to read more than one story in a sitting; I’d get really into a story, then have to completely switch gears to start the next one. It’s a great collection, but it made for a rather long read. There were several Westerns, several set in other countries, several in space, and of course some in that took place in that typical “magical realism” fairy tale setting. I want to pick out a few to talk about more specifically. The two stories that I found the funniest were by “Even the Crumbs were Delicious” by Daryl Gregory (a Hansel and Gretel tale involving a druggie and his lickable wallpaper with drugs) and “The Super Ultra Duchess of Fedora Forest” by Charlie Jane Anders (an obscure Grimm Brothers tale turned into “a kind of Adventure Time fanfic”). The most depressing stories actually came towards the front of the book: “Underground” by Karin Tidbeck and “Familiaris” by Genevieve Valentine. Both of these had a lot to say about the state of women in fairy tales, and it’s pretty bleak. They paint some interesting parallels to the state of women in modern life: no agency, trapped in their roles, expected to bear children they may not even want. I appreciated that they made this think about that but whoa, they were downers. My favorites turned out to be ones that didn’t deviate too much from fairy tale territory, but still managed to breathe new life into the original tale. “Seasons of Glass and Iron” (Amal El-Mohtar) is actually a mash-up to two tales, brilliantly done, that ends with the heroines saving each other by pointing out the truth of each other’s stories. “The Briar and the Rose” (Marjorie Liu) likewise has two great female protagonists that help each other. And anchoring the book is “Spinning Silver” by Naomi Novik, a nice take on “Rumpelstiltskin”; if you only read one story from the book, I’d recommend this one…then go read her original fairy tale, Uprooted. There were several other good ones as well (shout out to “Penny for a Match, Mister?” by Garth Nix–one of the Westerns–and “The Other Thea” by Theodora Goss). If you like fairy tale retellings, I think you will enjoy this collection also. One nice thing about collections like this is that you can sample some new authors in addition to ones you’ve already read and loved. I definitely want to check out more works by several of these authors. I hope you’ve enjoyed reading about our GeekNerdy Book Club selections this year; stay tuned for more in 2017.